Two others chose to join me on this last peak lead of this season. 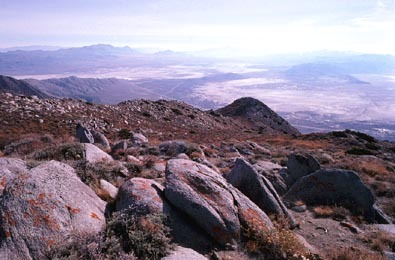 This was an attempt on Granite Peak in the mountain range north of Gerlach, Nevada. We left Friday night to drive to Pyramid Lake, and became lost in the dark. I knew that there was a campground somewhere, and took a likely looking dirt road to find it. Unfortunately, it was the wrong one, a sandy track, and my tires started spinning. I drove forward to try to get better purchase and momentum to get me out, but we were stuck. My efforts proved only to make things worse. We camped right there this night, with endless worry by me. In the morning, a jeep came by and radioed the owner of the Sutcliffe Cafe to come by and give us a hand. The gracious owner chained to us with his pickup truck, and pulled my car right out. That saved me perhaps $150 for a tow truck to come out from Reno. In sheer gratitude, I gave him $20 and we all had breakfast at his restaurant. I made sure I wasn't too cheap. We continued our little adventure and drove north to Gerlach to attempt our peak. Starting late, we climbed from the west, up the big hill, then the two others became separated from me. High on the peak, I wondered about going for the top and coming back in the dark. Solo, in remotest Nevada. Knowing I needed at least a thousand feet more climbing to the summit, I saw that I was out of time. Regretfully, I headed down alone and back to my car. I waited and waited, hoping the two stayed together. They appeared together, just about dark, and reported failing to make the top. I had my fill of this and decided to drive home, all the way that night. The others agreed. It just wasn't the weekend to make a climb. We had some dinner at a local cafe, though. I enjoyed the chance to get out, but winter was on its way. Nights were getting cold. I thought that I had better not wreck my vehicle or do anything foolish as I wasn't having much luck just now.